An experienced design engineer is utilising waste glass and gin bottles to diversify his business into the arts and crafts retail market. Jim Box, Managing Director of Peterlee-based Be Smart Solutions, saw a gap in the market to customise discarded glass bottles which are generated as waste on a large scale by consumers and business owners across the region. The concept of the business, which is based at Novus Business Centre, is to personalise the bottles which would otherwise end up at recycling centres, etching individual, hand-crafted designs or messages directly onto the glass with re-usable vinyl stencils. The customer then has the option to choose either battery, solar or USB-rechargeable LED lighting to the interior of the bottle, which is packaged in recycled, recyclable materials. The gift bottles can then be given as presents for birthdays, weddings and other celebratory occasions, or as decorations for the house. Jim is now working on establishing partnerships with restaurants and pubs in the area such as the Royal George at Old Shotton where one of the initial concepts was recently displayed with a special Valentine’s Day bottle. Jim is now working on a selection of bespoke branded bottles for the popular public house and restaurant. Jim said: “My core business is working with companies within the engineering industry, predominantly in the lighting and automotive sectors as well as small to medium start-ups, which require bespoke designs for products that they are manufacturing. 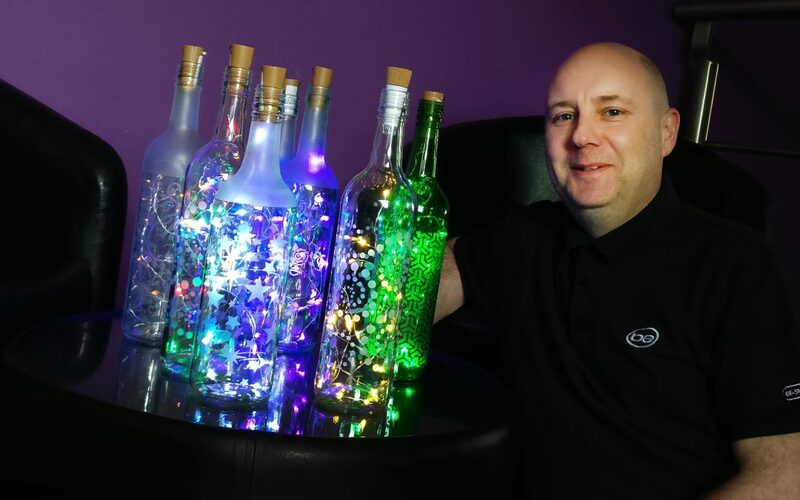 “However, given all the uncertainty around in the current business climate, I decided to look at other ways to utilise my skills and realised there was a gap in the market to take discarded wine or other alcoholic bottles and turn them into decorative lighting gifts. The designs can be personalised and can be as intricate as the customer requires and all are done at our offices in Peterlee. “The good thing about this process is it is taking products which are readily available at both homes and businesses and giving them a new lease of life. Once the bottles are finished with, they can once again be recycled. Jim is now exploring what other materials and products could be recycled, and where he gets them from, as he looks to expand the product ranges that Be-Recycled.com offers. Over the coming year the company will launch and roll-out of a range of candles and Gin Table Lamps to compliment the current LED Fairy Light Bottles.